This is my latest fiber art piece done specifically for a show at Highfield Hall in Falmouth, MA, which will open on Sept 28, with a reception from 5-7. 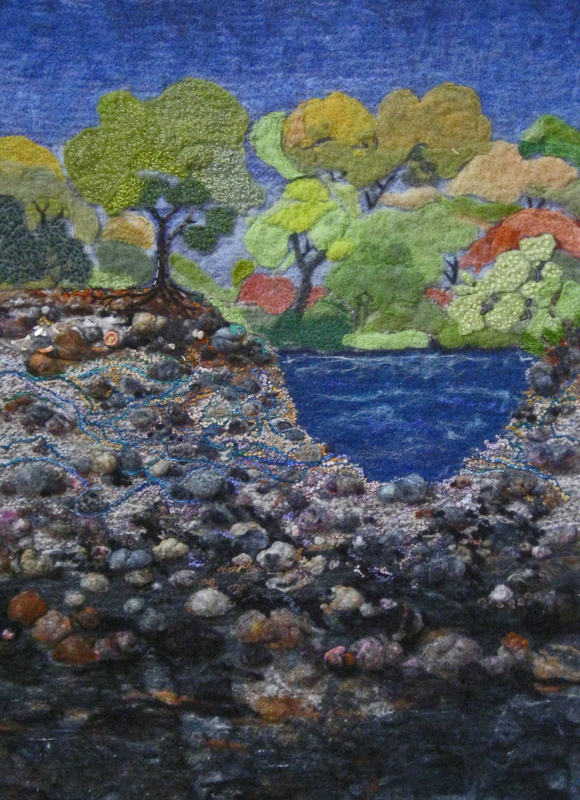 The fiber art portion of the show is called, “The Intimate Woods,” and features the work of 10 fiber artists from the Upper Cape area who met frequently over an 8 month period to share ideas and provide encouragement. This piece was created by knitting, fulling (shrinking knitted wool in hot water), needle and wet felting to lay out the basic design. Then, embroidery, bone, shell, and clay were added to fill in the details. I made it to represent the glacial moraine that lies under the woods and surrounds the kettle pond, affectionately known as the Punch Bowl. Our show is part of a larger exhibit called, “The Trail Leads to Our Door.” Both exhibits will run through mid November. Highfield Hall is surrounded by Beebe Woods, 383 acres of conservation land which is enjoyed by many residents and visitors alike all through the year. These shows honor these surroundings. I blew up the Punch Bowl photo so I could see all the details which are many and intriguing.